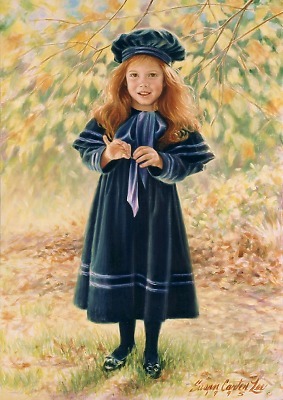 oil on linen 40" x 28"
Working with Susan Carter Lee was an educational experience in the area of art. She had the right amount of sunlight, background, props, all while keeping my young ones entertained in their Sunday best! When I was pregnant with my first daughter, I saw Susan's portraits and knew that she was the only artist who could capture the innocence, simplicity, and freshness in children's faces. She painted my daughter at age 5, and my next daughter when she was 5, and finally, my last daughter when she turned 5! With each painting, Susan progressed and grew in her craft. Each painting is special in its own way-not only because of the subject matter, but because of the growth of the artist.